Fender’s “335” part deux. Nice try by the CBS boys but this was about as popular as “Co-Ed Fever” was on CBS in 1979. It lasted one episode. The Starcaster lasted 5 years. So, it’s 1975 and Gibson is still trying to emulate Fender and Fender is still trying to out-Gibson the folks at Gibson. The last time Gibson tried to compete with the ES-335, they came up with the Coronado which failed. Perhaps not spectacularly, but it did fail, lasting from 1966 to 1972. Contrast that with the ES-335 being in production from 1958 until, uh, what time is it now? The Coronado really only competed superficially anyway. The guitar was fully hollow and had single coil pickups and a bolt on neck. It was very much a Fender version of a 330 rather than a 335. And it never competed successfully with either. By 1975, the ES-335 had perhaps gotten a bit tired and with the diminished quality of 335’s of the era under the dubious auspices of the Norlin Corp (beer, concrete), perhaps the time was right for Fender to mount another assault on the once mighty ES-335. Gibson was still selling 2000 of them a year but that pales in comparison to 1967 when they sold closer to 7000. Enter the Starcaster. It didn’t look that much like a 335 with it’s very Fender like offset waist but it had two f-holes, a solid center block and humbuckers. The Starcaster still had a bolt on neck (and a three bolt at that) but from a structural and electronic standpoint, it was a lot more like a 335 than a Coronado was. 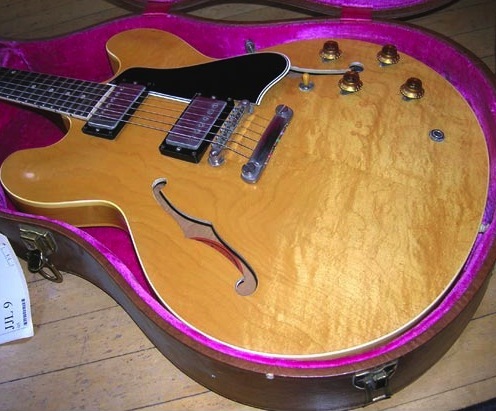 There were little things that made the guitar more 335 like than its predecessor. Many came with figured maple tops and backs and the black multi-ply pickguard was very Gibson like but the guitar also retained some truly Fender-like aspects. The strings loaded through the back like a Strat or Tele, the tuners were six on a side and the fingerboards were maple. Just like a Fender. I don’t think I’ve ever seen a Starcaster with a rosewood board. But nobody bought them. The prevailing wisdom was that if you wanted a semi with humbuckers, you buy a Gibson. If you want a solid body with single coils, you buy a Fender. The Starcaster was released during an arguably dark era for electric guitars. Quality at both companies suffered as a result of the rise of the bean counter. Profit trumped tone and that was that. 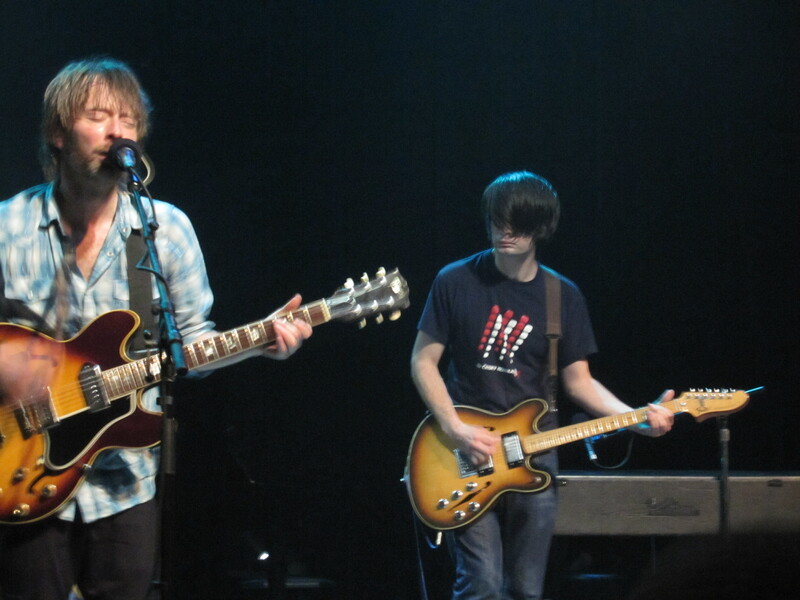 But the Starcaster is actually a pretty well conceived and well executed guitar for the era. I think it might have benefitted from a set neck but they are quite playable and they don’t sound too bad either. They don’t sound much like a Fender, that’s for certain but they don’t really sound (or feel) like a 335 either. I’ve only played a couple of them and wasn’t terribly comfortable with the body shape, the longer scale and the somewhat headstock heavy feel (Schaller tuners don’t help that). I did like the maple board and the master volume was actually sort of useful. The three way is in the wrong place unless you’re used to a Jazzmaster. Interestingly, the humbuckers were designed by none other than Seth Lover (yes, that Seth Lover) but they weren’t much like the PAF’s he designed way back when. 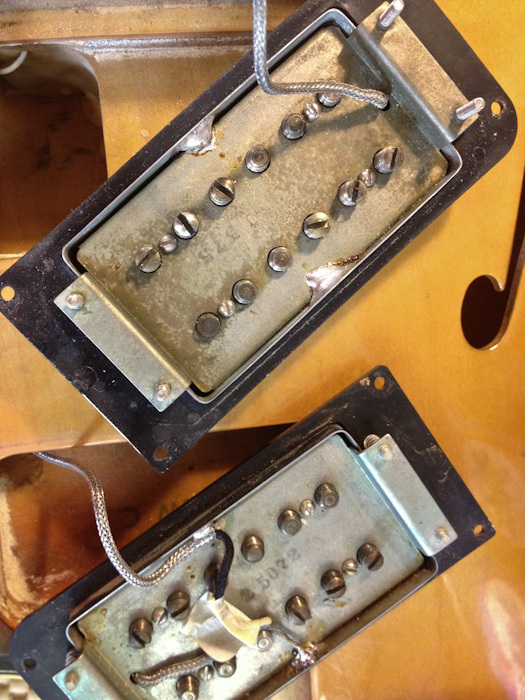 The Fender “wide range” humbucker had 12 separate magnets machined into poles like a fender single coil. They were wound to 6800 turns and usually read about 10K ohms. The design was, supposedly, meant to give a single coil sound only fatter. Which I suppose meant that they sounded like a Fender hum bucker (duh). By 1980 (or so-again, it depends on who you ask), the Starcaster was history. I understand they just reissued it but I think, once again, it will have a tough time competing with the 335. So, if you want to look at it this way, the score in years is 55 to 5. ES wins. I don’t expect the Starcaster to be a collectible of the future with prices rising to 5 figures or more but I wouldn’t be surprised to see a resurgence every now and then as some young rock star gets his hands on one and makes his statement. Having Seth Lover design your humbuckers must be like having Frank Lloyd Wright design your garage. It’s a good pickup but it’s not his best design ever. Go, Jonny, go. 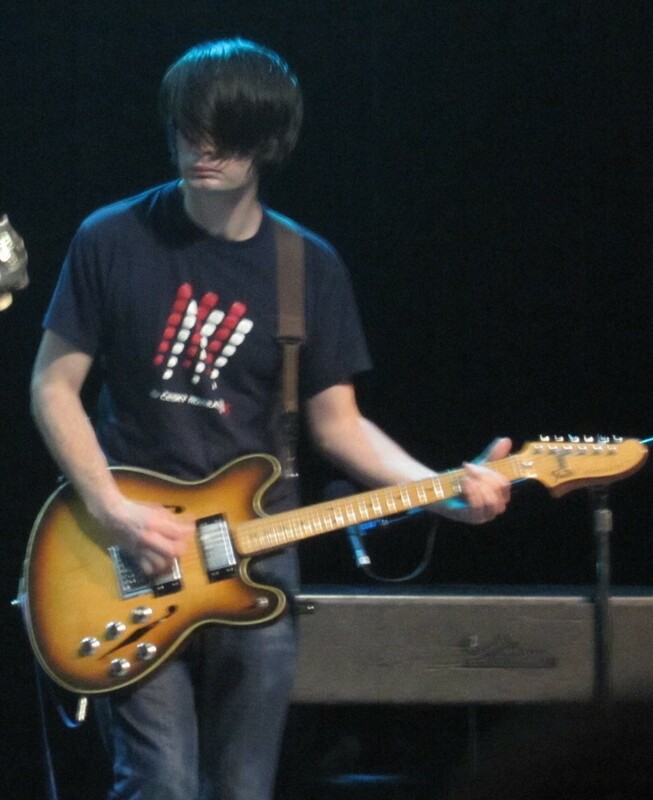 Jonny Greenwood plays his Starcaster with Radiohead. Nothing wrong with a trap tail ES-335, if you ask me. They sound a bit different but I can’t really say they sound worse. A little less like a solid and a little more like a hollow body perhaps. This was one of two big, big changes in early 65. This one has a chrome tailpiece and pickup covers but still has a nickel bridge. The transitions that occurred during the life of the ES-335 (and 345’s and 355’s) were, more often than not, fairly benign. Changing from single ring tuners to double rings is pretty inconsequential but other changes were huge. They probably didn’t seem huge to anyone at the time they were made (except for perhaps Gibson’s bottom line) but today they loom very large. It’s January 1965 and there have been no major changes in the new model year guitars. Not yet, anyway. What followed in the late winter/early spring of 65 are perhaps the two biggest changes in the history of the model. They account for the huge drop in value from a vintage perspective but they were probably seen as no big deal or even improvements over the 64. With the appearance of The Beatles on The Ed Sullivan Show in February of ’64, the guitar boom officially began. Sales at Gibson would more than quadruple in the years from ’64 to ’67 and they would be hard pressed to keep up with the demand. While 335’s were never a totally handmade guitar, the techniques of mass production, some of which were in place at Fender, were less established at Gibson. It takes a lot less time to bolt on a neck than it takes to glue one in place. The steps required to install a stop tailpiece are many-drill the holes, install the bushings, install the studs, install the tailpiece. The change to a trapeze tailpiece required drilling three holes and screwing in three screws. And yet, that change alone is one that collectors see as a turning point and the price of a trap tail 65 vs a stop tail 64 bears that out. The other major change was the nut width. In the mid 60’s, rock, in all it’s 60’s incarnations was generally played relatively fast. The guitar companies jumped on the concept of the “fast” neck. Thin meant fast and Fender led the way. Gibson, presumably to compete with Fender, changed the nut width from the usual 1 11/16″ to 1 5/8″ and quickly to 1 9/16″. The depth would slim down as well and by late ’65 the normal nut width was 1 9/16″ and the depth at the first fret was around .78″. The depth would vary from guitar to guitar and from year to year probably because the necks were still hand shaped but, in general, they were pretty small (they got bigger but not wider in 67). No one though much of it at the time. Those of us who were playing in the mid 60’s pretty much bought into the faster is better and thinner is faster concept. I remember my guitar teacher telling me (in ’64) not to get a Fender because the necks were too hard to play because the necks were so narrow. He was a Magnatone dealer and wanted to sell me one of their Strat like solid bodies which had wider nuts. I, of course, got a Fender. The point is that this change looms very large in the collectors mindset but really wasn’t much of a big deal at the time. The current trend toward big fat necks was largely a by product of the popularity of early Les Pauls touted by the early vintage community in the 80’s and 90’s. The “my neck is bigger than your neck” rivalry is still alive and well and I’m certain that plenty of players buy big fat neck guitars even though they’d probably play better on a thinner one. While these were the transitions that mattered, there were others that occurred in 65. The change from nickel hardware to chrome was a gradual change that started with the pickup covers and eventually (as stocks ran out) included bridges, tailpieces and lastly, the pickguard bracket. The change in the truss cover bevel happened at the beginning of 65 as well. So, lots of changes but really, only the end of the stop tail and the end of the 1 11/16″ nut were significant enough to be seen as the endpoint of the Golden Era. The most significant change to the line is the shrinking nut width which went from 1 11/16″ to 1 5/8″ to 1 9/16″. 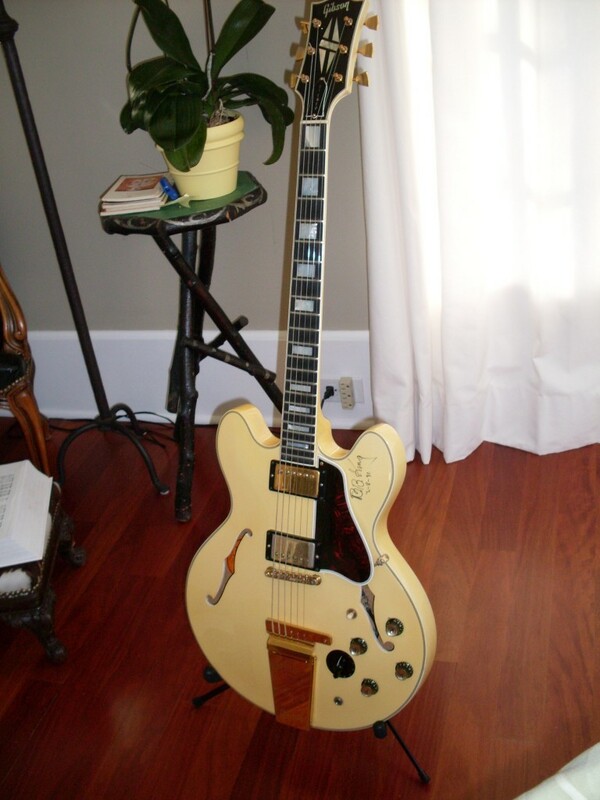 This 65 ES-355 (factory white) has the skinny nut. I’m only showing this one as an example because you deserve to see something cool and unusual. Also note the narrow bevel truss cover which showed up on all ES models in early in ’65. Most 335 aficionados will agree that this is the top of the heap-a 59 ES-335 TDN. I would have to agree from a price point, for sure. Myself, I prefer the unbound 58’s but that’s just me. The history of the 335 is full of transitions. That shouldn’t surprise anybody as any good product goes through refinements, improvements and alterations during it’s lifetime. Some make the product better, some make the product cheaper to manufacture and some make the product more “modern”. At some point, Gibson (and Fender and the rest of the big players of the era), placed a higher priority on making money than in making the best possible quality instrument in the world. Finding that point is pretty easy. This explains why some years are “better” than others. If you’re a 335 geek. like I am, the history is pretty interesting. The early 58 is a great guitar but it’s rather different from those that followed. The top is thinner and it tended to split, so in 59 they made it thicker. The neck was unbound and it seemed sort of low rent to some buyers, so they bound it. So, making it cheaper wasn’t the issue at that point. Making it nicer and more durable and more sellable seems to have been the motivation. Most 335 aficionados feel that the 59 is the pinnacle and it may be but it’s pretty subjective. It’s got a lot going for it–PAFs, big neck, great finishes and so on. So why did they change it again in 1960? They made the neck thinner and they changed the tuners. The tuner change from single ring to double ring is pretty much inconsequential. But the change in neck profile is, for now anyway, huge. The trend in recent years (and a lot of recent years at that) is for larger neck profiles but in 1960 and for many years that followed, it wasn’t the case. 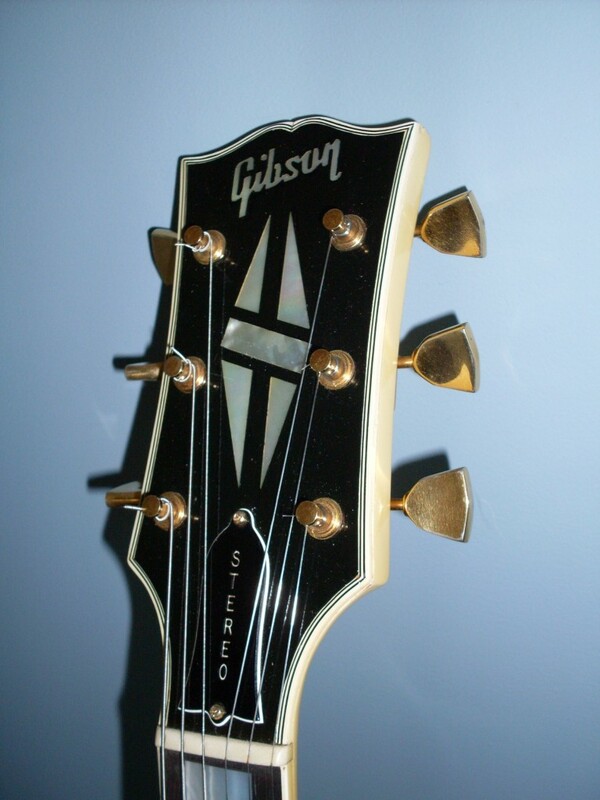 Thinner neck profiles were all the rage for quite a while and Gibson was simply keeping their product current (and competing with Fender). The advertising pitch was that a thin neck was a “faster” neck and, back then, “fast” was good. By 61 it was pretty thin but still wide at the nut. These guitars can be excellent and can sound wonderful but not for you if you want a big fat neck. 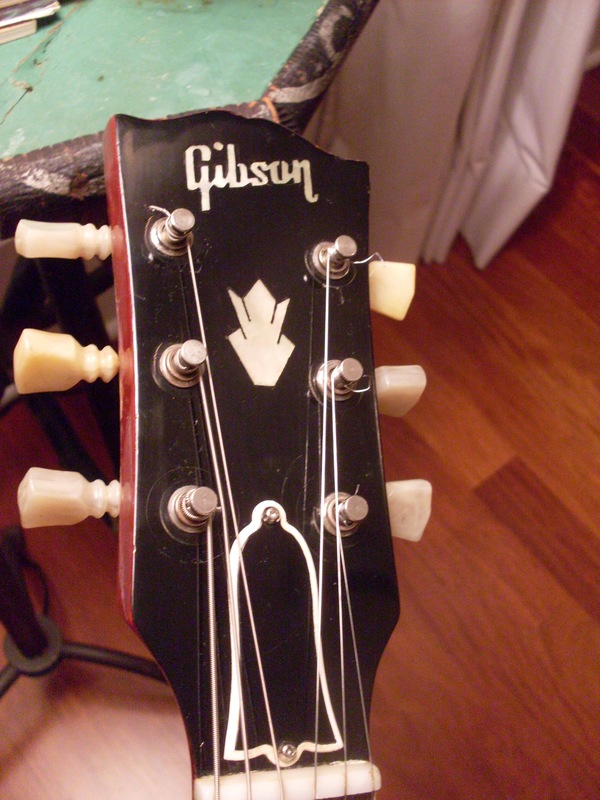 The big change in 62 was to the block inlay and, again, Gibson was responding to the comments from customers. Many felt the dot markers were, like the unbound neck of 58, kind of down scale. So, Gibson switched to blocks (and probably raised the price). They also switched from PAFs to patent numbers but the pickup was the same (more or less). The guitar remained essentially the same through mid 63 when they changed the body shape and the neck profile. Body shape is subjective and the change was mostly a matter of practicality, not economics-the story is that the forms wore out and had to be replaced. There was also some talk about the arches on the cutaways being too extreme and causing some failures during manufacturing. The change to a more substantial neck profile was, I believe, in part, a response from customers and maybe, just maybe, they made the change because too many necks were warping or breaking. For us modern players, this makes the late 63 and the 64 very desirable because of the bigger necks. So, up to 64, Gibson wasn’t really trying make the guitars cheaper to build, they were trying to make them better. Then, in 1964, the guitar boom hit–read about it here. Suddenly, Gibson had more orders than it ever had before-thousands more- and they had to make some changes in order to keep up with the huge increase in demand. This required changes to the manufacturing process that would speed up the process and, in so doing, made the guitars cheaper to produce. It also marks the end of the so-called Golden Era and the end of the high priced “collectible” 335. More on this to come. Is this 64 the end of the “Golden Era”? Actually, not quite. The early 65’s were identical to the latest 64’s but things at Gibson were about to get a bit frantic and big changes were looming. Klusons on my 62 with the good adaptor bushings that look almost exactly like the original ones. 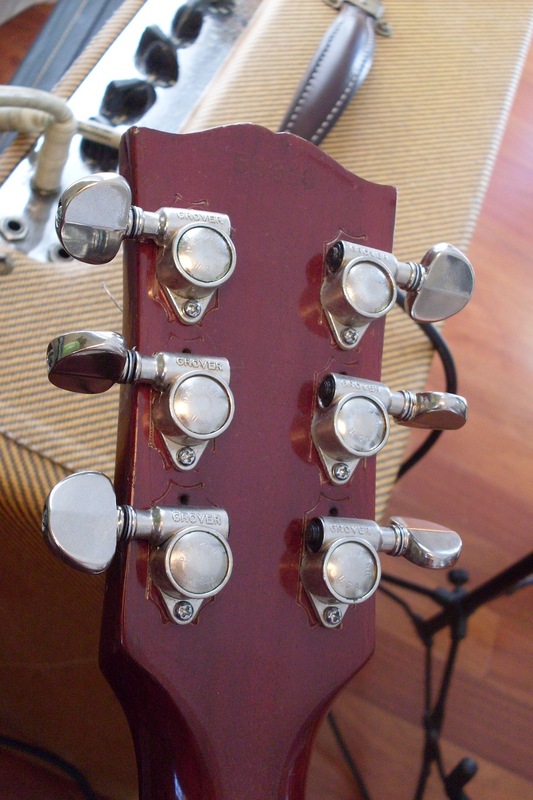 This had Grovers-you can still still the imprint from the big washers on the front of the headstock. There are adaptors that will cover these but they look wrong. No visible holes on the back, however. Fight of the century? Not exactly. Well, maybe last century. The most common mod done on vintage ES’s is changing out the tuners. This wasn’t some short lived fad like coil taps or phase switches, this was usually a matter of everyday function. 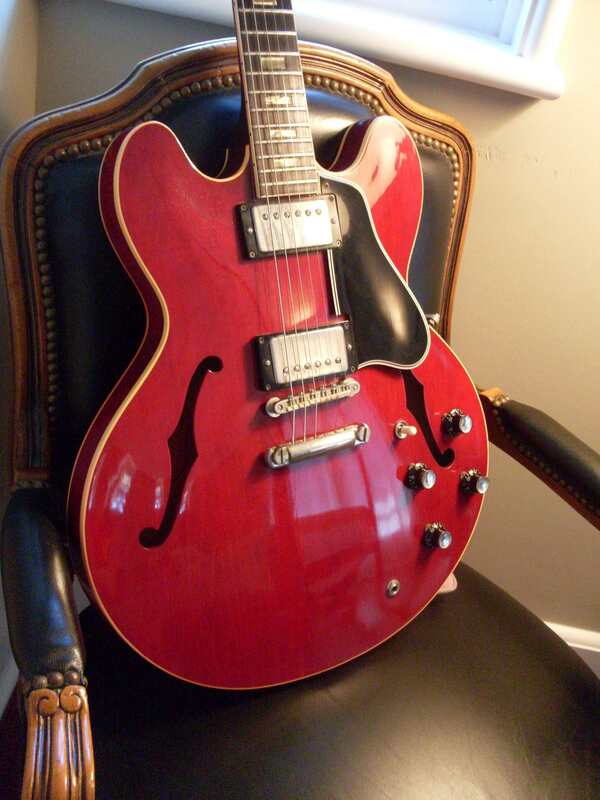 Consider this: It’s the early 1970’s and you play, say, a ten year old ES-335 dot neck. You probably paid a couple hundred bucks for it used and you played in a band (everybody played in a band in the early 70’s). You probably had some real tuning issues at the time-more than likely caused by a binding nut or faulty intonation-but you blamed it on the tuners. But that’s a whole ‘nother story. So, what did you do? You changed the Klusons for Grovers (or, later, Schallers). We all know how that decreases the value of your $30,000 dot neck today but back then it made a certain amount of sense. Even then, it was clear that Grover was a superior tuner and it still is if you compare vintage Grovers to vintage Klusons. Klusons generally work just fine but they can be a little quirky-like when you have to tune past the proper pitch because it slips back on its own. Part of the problem with Klusons is that nobody ever took care of them. I’ve had 50 year old Klusons that have never experienced a single drop of oil. Grovers were sealed and rarely failed. They almost always worked smoother and more accurately than Klusons, so the change made perfect sense. OK, they were a little heavier but nobody was too worried about weight back then-we were young and indestructible. Besides 335’s aren’t all that heavy to begin with. Truthfully, I’m surprised more guitars weren’t switched. The big names were doing it too-Clapton’s 335 had a set of gold Grovers, Harrisons 64 SG had Grovers, Elvin Bishop’s “Red Dog” 345 had (and probably still has) Grovers. The list goes on and on. Most folks won’t argue the point of Grovers being a better tuner but vintage folks still want the original Klusons and no extra holes. If I were still a gigging musician, my player would have a set of Grovers on it but I wouldn’t take a set of Klusons off and make the mod on a vintage piece. The reason for that is obvious-a set of Grovers on a vintage guitar knocks off $1000 or more from the vintage value. Even if no new holes are drilled (Grovers can use the same screw hole as Klusons), you still have to enlarge the shaft hole and even though you can’t easily tell a good adaptor bushing from a correct vintage bushing without removing the tuners, the damage is done. There are, by the way, a lot of adaptor bushings that are obviously adaptors-don’t use those if you want your guitar to look original. I have also heard the argument that the guitar sounds better with Grovers-something about increased mass but I don’t really hear it. If you are considering a player grade vintage ES, the Grover mod shouldn’t scare you off. It simply makes the guitar a very slightly better guitar. A worse investment, I suppose, but usually a better player. Schallers were also a better tuner but they usually required another hole to be drilled and they had a very distinctly non-vintage look to them. Personally, I think they are ugly so I take them off whenever I get a guitar that has been modded with them. You get stuck with 6 extra holes but ugly is ugly. You can have ugly holes or ugly tuners. At least you can’t see the holes from the front. Grovers on the same 62. You can see the single screw holding the tuner goes right into the Kluson hole, so no new holes are necessary. However the tuner shaft is larger on a Grover and requires drilling out the shaft hole. That’s what the adaptors are adapting in the top photo. 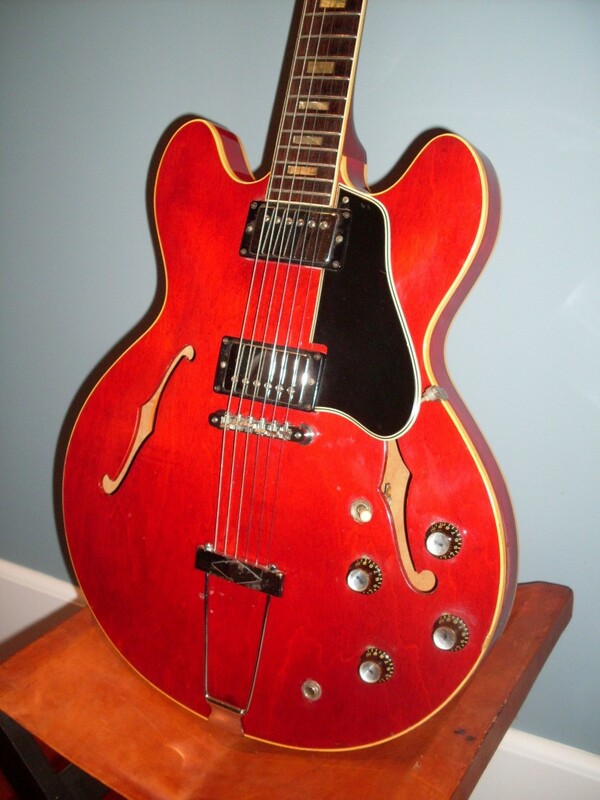 This 63 ES-335 just sold for just under $11000. Still shines like new and is bone stock with a few Bigsby holes. This was a $13500 guitar last Spring. Where did everybody go? My readership dropped by 40%, my guitar sales slipped to somewhere between slow and stop and my email volume was off by at least 30%. On top of that, the market (Ebay and dealers) is flooded with 335’s and 345’s. Block necks are everywhere and still wildly overpriced. It seems like we have another standoff between the sellers and the buyers. The buyers are not paying $12000 for a Bigsby block neck any more. The sellers still seem to think they can get anywhere from $13,500 to over $20K. Stoptail 335 block necks might fetch $15K but even that seems a bit of a stretch these past few months. The same inventory is listed week in and week out on Ebay and only a sucker makes a move on a $20,000 block neck unless its dead mint. 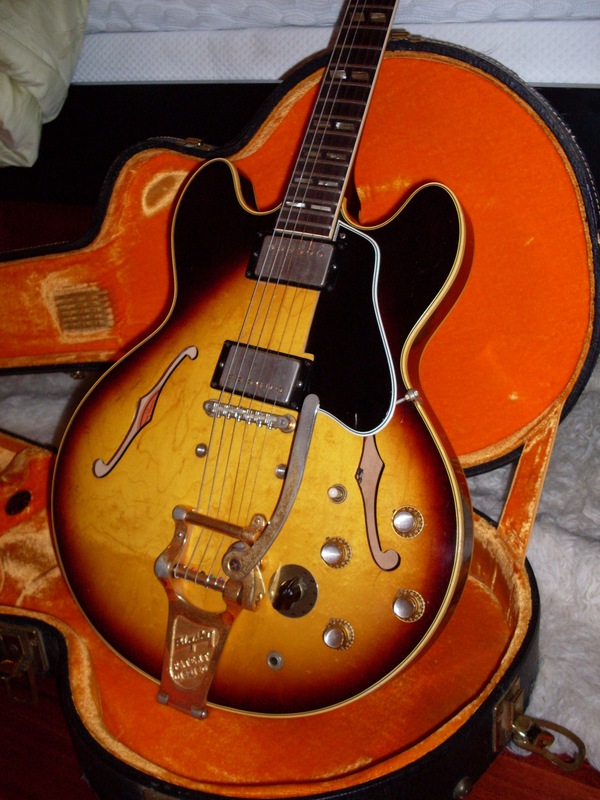 I had a 63 ES-335 on Ebay recently–original stoptail with holes from an added Bigsby. Beautiful condition, too. I listed it on my site for $12500. No takers for four months. I listed it on Ebay for $11,500 and got no bids. Plenty of offers but no bids. I did sell it for a bit less and felt the buyer got a great deal (especially since I didn’t make a dime on it). It’s simple. The supply has outrun the demand for now. Sorry sellers but that’s the current reality, like it or not. There are brighter spots-the dot neck market (especially 58 and 59) is still very strong and the ES-330 dot neck market has kind of come alive this Summer. In fact, I sold more 330’s in August than I sold 335’s. The ES-345 market is no better. 59’s still fly out the door but later ones, especially Bigsby’s need to be priced well under $10K to garner much interest. When’s the last time you got an all original bone stock early 60’s ES-345 for under $8000? It’s been awhile. I like to move guitars not sit on them-when I buy a guitar, I’m not making an investment, I’m buying inventory. This might be your best buying opportunity since the bubble burst in ’08. The market has inched up in the past five years and I think sellers have again gotten greedy and this time, the guitar buying public isn’t buying into it. Of course, the Summer is pretty much over and folks are getting back from vacations and turning to the more important things in life (like adding to your guitar collection or getting that elusive “dream guitar”) so I expect a bit more demand. Like the housing market, it takes a really long time for the realities of a sagging market to sink in. Some dealers and sellers still think the prices of 2008 are current while others think the market has run up from there…”uhhh, gee, I’ve got this appraisal from Gruhn from 2007 and that was six years ago, so the guitar must be worth a lot more by now…” So, what do you (the buyer) do? You make yourself a great deal and get that guitar you’ve always wanted. Make an offer that fits your budget. And don’t worry about insulting the seller-he doesn’t mind insulting you with a ridiculous price. You can tell your wife that the prices haven’t been lower for that 64 335 since 2009 and that it’s probably a good investment again. If you don’t overpay, you can almost certainly get your money back and more in a few years and you get to play the guitar as much as you want. Think of it as free rent for as long as you possess it. Oh, and don’t break it. 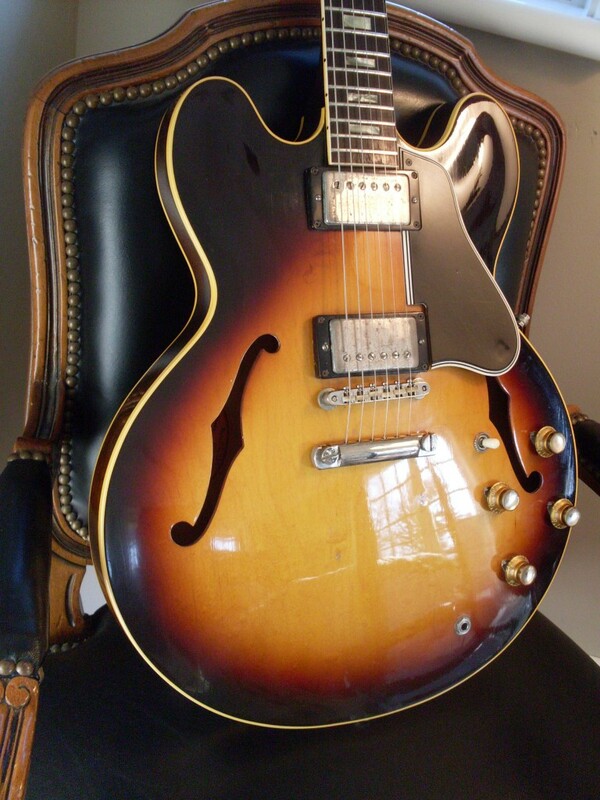 This 63 ES-345 is bone stock and sold recently for under $8000. I’ll take that deal all day long.